These little tarts are precious, and I just love the bruleed tops! I feel like I might get myself into trouble popping these babies one after another into my mouth. They definitely look like they have the potential to destroy any glimmer of will power I might possess. Do you mean our oven grill function can't give the cramelised colour? I was thinking to get a blow-torch but ever since everything I bake not really require this blow-torch yet. Here you've got a nice caramelised colour on the little egg tarts. 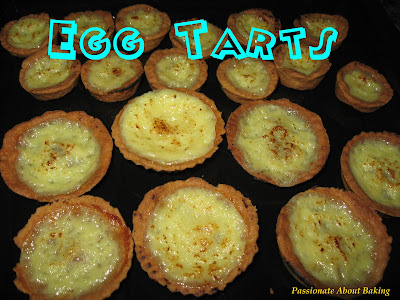 Wow, your egg tarts looks like Portuguese Egg Tarts with the caramelized top, nice! Thanks for the compliments. I wanted to play with my blow torch, so I created some excuse to use it!